The King presides over the Council of State Fridays at 11.00 hours. The Prime Minister sits at the Kings right hand and the other ministers sit round the table in order of rank. 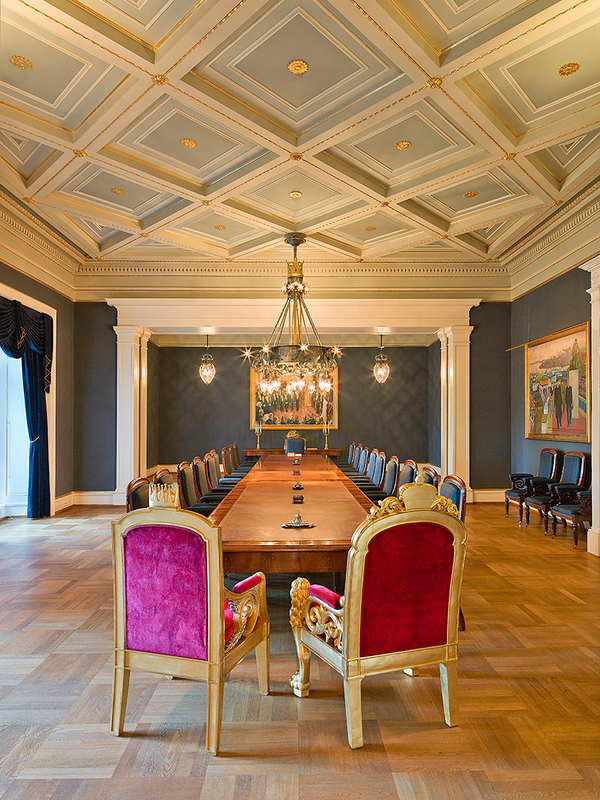 At first the Council Chamber was part of the Kings official apartments on the second floor, but under King Haakon VII it was moved to the first floor, and the architect brothers Carl and Jørgen Berner were given the task of adapting the old guardroom in the Queens apartments to its new function. The former council chamber is now the Kings study and the room where he gives audiences. Architect Linstow had originally intended the guardroom on the first floor to have a coffered ceiling, but this proposal was not adopted. However, when the room was transformed into the Council Chamber a coffered ceiling was added. The number of government ministers has increased over time, and the Council Chamber gradually became too small. In the 1990s it was decided to expand it by removing the wall dividing it from the adjacent antechamber and combining the two rooms. However, it was decided not to extend the coffered ceiling and to maintain the separateness of the two rooms by retaining the starred ceiling of the antechamber, which was designed by architect Arnstein Arneberg in the 1950s. 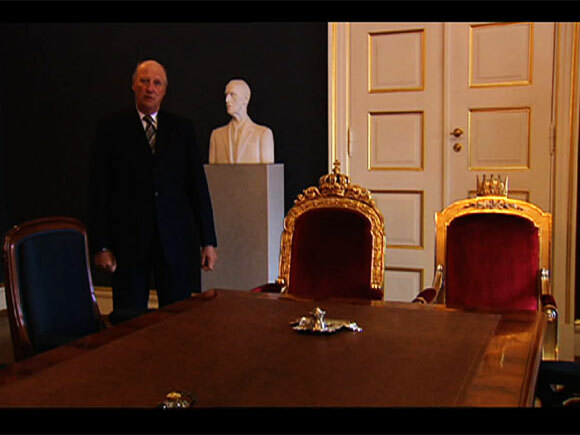 During the reign of King Olav V, the room was painted yellow and had red curtains and red upholstery on the chairs. In the restoration of the 1990s this was changed, and today the colour scheme is blue, white and gold, underlining the formal nature of the room. The Kings throne chair was designed by Linstow in the 1840s. It has Neo-Baroque elements and was produced in Sweden. The Crown Princes chair is from 1997, and is only used when the King and the Crown Prince are both present at a Council of State. When the Crown Prince presides on behalf of the King, he sits in the Kings throne chair. The remaining original chairs were made in 1880 by master cabinet-maker Schrøder for King Oscar IIs council chamber on the second floor. They have been restored and are upholstered in blue horsehair. In recent years exact reproductions of the chairs have been made to accommodate the increasing number of ministers in the government. The table was also made by Schrøder. It is in Cuban mahogany, and has been lengthened to seat the greater number of ministers. The oldest part, facing the Kings chair, has drawers where paper and writing materials for the use of the ministers were kept. The quotation comes from Frostatingsloven, the law relating to the Frostating, which is Norways oldest court. Frostatingsloven is one of Norways oldest laws, and was written down in about 1260. This well-known Norwegian quotation is inscribed on the great art nouveau chandelier, designed by the architect Jørgen Berner. The tear-shaped lamps in each corner of the room are new, and were specially made by Høvik Lys and Hadeland Glassverk as part of the restauration work in the 1990s. The globes echo the shape of the chandelier. The paintings in the Council Chamber depict important events in the history of the monarchy since the dissolution of the union between Norway and Sweden.